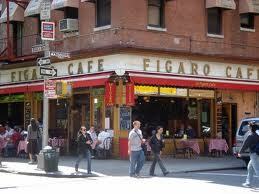 Café Figaro, a coffee shop on the corner of MacDougal and Bleecker was a single, crowded room, wallpapered with yellowed-with-age copies of Le Figaro, a popular French newspaper, and dominated by a huge espresso machine at the back of the room. It was always crowded, noisy, and smoky. Its owners were Tom and Royce Ziegler, a young couple, who had moved the establishment from further west on Bleecker Street. What made Figaro’s really special was Royce, who was beautiful, hard-working (she managed the place), a bit of an air-head, and overall one of the most delightful women I’ve ever met. On the left side of the room, there hung a life-sized painting of a standing Royce in a blue dress done by a young artist named Peter Heineman, who was a Figaro customer. It was a lovely painting, and I wish I knew what had happened to it. Royce and I had spoken many times, and I often bemoaned my fate at being stuck up on 51 Street and the lousy tips I was making there. One evening as I was making my usual stop in the Figaro to play a game of chess, Royce asked me if I wanted to be a “waitress” in her establishment. As the rest of the staff was women, except for the operator of the espresso machine, I understood what she meant, and immediately accepted. I worked at the Figaro for almost four years, while attending Brooklyn College, and it was an experience never to be forgotten, as it wasn’t just a job, but an induction into a community, one it was difficult not to love. The people of Figaro, its owners, its staff and its customers were a fascinating lot. There was an “inside” group that generally sat at a large, round, wooden table at the back of the room, near the espresso machine. This group was made up of “regulars” who were there just about every day, some of them slated to become famous, and off-duty staff and managers, some of whom had rejected lucrative careers in business, and there was me, a part-time waiter and college student. Almost everyone there was older than I was, and so I most often listened in respectful silence. Some were writers, some musicians, and they talked of Broadway productions, their own work, their hopes and aspirations, their loves, and just general gossip. To me, it was the people themselves and their stories that were interesting. Among the more interesting ones was the story of the establishment of Figaro. It seems that originally it had been a much smaller coffee shop across the street, in what had been earlier a drug store, and before that a funeral parlor. Funeral parlors seemed popular in this old, Italian neighborhood at the time. Royce and her fiancé (who was not Tom) ran this smaller version of Figaro, and their little business prospered. When Royce inherited some money, the time seemed ripe to expand and get married. Royce’s fiancé designed the new Figaro (which in its insistence on “old” and French was startlingly innovative at the time), which was to be established at the corner of Bleecker and MacDougal. However, on their wedding day there was a hitch. Royce eloped with the best man, Tom Ziegler. Not only did Tom get the girl, but he also got the Figaro once it was finished. Is Care Figaro still in operation ? After Tom sold the place it went through several stages, none of them connected to the original Figaro. It was even a Blimpy’s for a while, then re-opened as Figaro, but really not the same thing. Then it was a bar and restaurant. Now I don’t know. After Tom was diagnosed with cancer of the throat (he smoked several packs a day), we had a 25th Anniversary Reunion (and good-by to Tom), we had to use the Judson Memorial Church (on Washington Square) because the new owners wouldn’t allow us to use the Figaro, which would have been most appropriate for this party. The Figaro meant a lot to many people for a long time. Cafe Figaro and your time there sounds amazing. And so they were. I think we were all aware even at that time of what a special place it was. The fact that other places that opened there used the name “Figaro” tells you something of its cultural importance to the life of the Village at that time. There will be more on Figaro. Thanks so much for publishing your memories of the Figaro Cafe! Royce was my mother’s cousin, and spoken of reverently by those family members who remember her. I am too young to have known her, and really knew little of her story, so it’s pretty eye-opening to hear how important she and her cafe were to the cultural life of Greenwich Village in those remarkable days. Nice to hear from a member of Royce’s family. She was really a fantastic lady. You would have loved her, as everyone did in her much too brief life. I knew Tom,and is brothers Bobbie and Bert in the early 60’s. When Tom was dying in LA a gal named Annie and her friend Xan Grant cared for him . I never knew Annie’s last named and have been trying to track her and Xan down. Thanks for the post, Blaine. I knew neither Xan or Annie. As to his brothers, I didn’t know them, although I might have met one of them once. I knew that Tom had an LA connection, but I didn’t know what it was. I think that for a time he was involved with Bill Cosby in opening a Figaro West. But these are but vague memories, as all this happened so long ago. The painting you mentioned went to Cafe Figaro in California back in the early 70’s. My stepfather was friends with Tom & Royce & his GROOVY girlfriend Susie. Bill Cosby did invest some money in the place, but I don’t think there was any ROI for investors, other than eating there & signing the check! I was 13 years old when they were building the L.A., Figaro & my mom & stepdad were sweat equity investors along with other people who thought that they would get rich….gadzooks! Tom pocketed cash from the till nightly & stiffed the IRS & his investors as well as the staff. I remember that Royce had some type of paralysis & my mom said that “it” was the reason Tom had a girlfriend. The painting hung in the back of the restaurant between the Ladies room & Men’s room & pay phone. and it was quite sad to see her walking around Greenwich Village with just her two boxer dogs for company. Also sad to think of that painting between a phone booth and a men’s room. Wish I knew where it was now. If the price was right I would buy it. Apologies for not answering sooner. Had some weather-related problems here. No electricity. Still don’t have any. What a gorgeous article. I’m sad I’ve only just found this. My mum, Jeannette Randall, was a waitress at the original Figaro with Royce and Tom. She treasured their friendship and her time there. I grew up with the most brill stories. She’s also talk about the Fat Black Pussycat, and friend John Mitchell. I was and still am enthralled by her experiences.